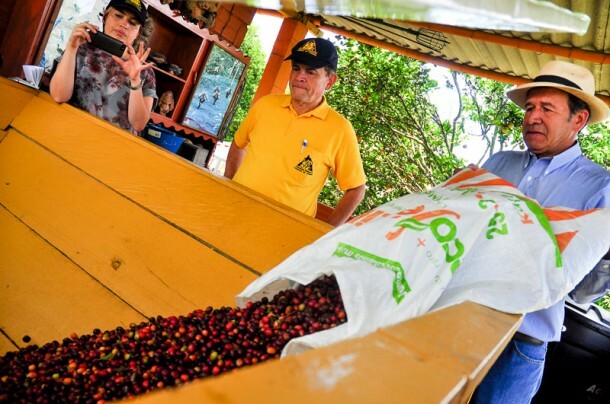 If you missed Part 1 of my recent trip with Cafe de Colombia, check it out at “Where does coffee come from?.” We left off where farmer Alirio Rios and his pickers had harvested the coffee cherries. 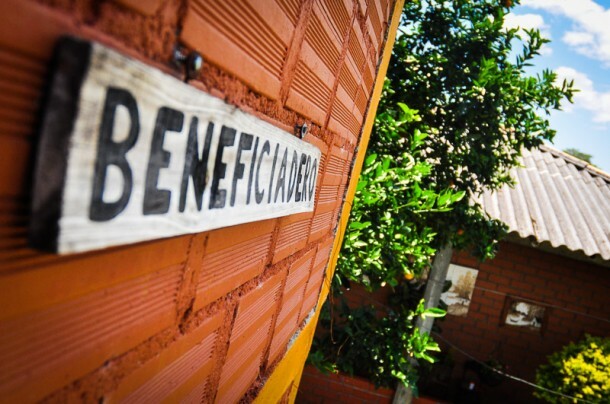 The next step is to remove the seeds at the beneficiadero, or processing station on the farm. It’s an unglamorous process that’s nevertheless an essential part of the quality-focused farmer’s craft, and it has a surprisingly big impact on flavor – let’s take a look! There are many different ways to remove these layers, largely falling into two categories: wet processing (i.e., washed), and dry processing (i.e., natural). Tradition, local climate conditions, and market demand for certain flavor profiles all lead to the choice of one or the other. 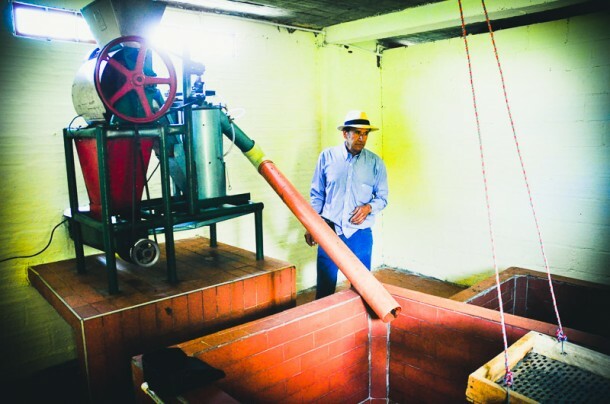 In Colombia, wet processing is the more common method (photos below). 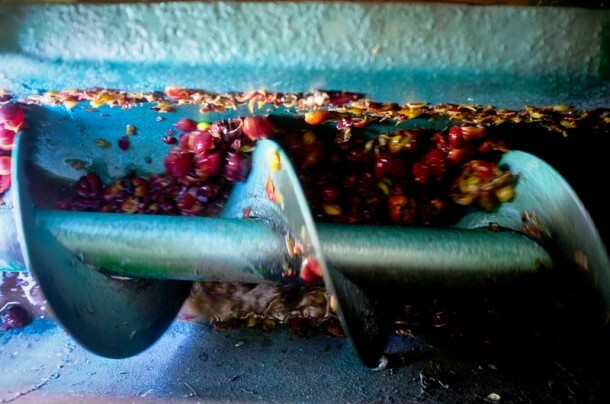 This generally means using machinery and water to remove the pulp and mucilage before drying the coffee. 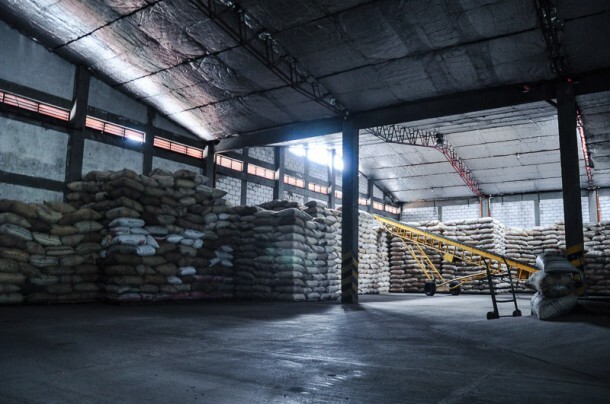 Traditionally, the pulped coffee is soaked for a day or two in water tanks, allowing enzymes to go to work, causing fermentation to break down the mucilage. Just like cheese, wine, and kimchi, fermentation impacts coffee flavor in various ways. Motivated farmers can use this as an added tool to shape flavor by controlling the fermentation process (through temperature, duration, etc.). However, the wet process uses a lot of water (duh), and the runoff becomes saturated with waste material, causing pollution and environmental consequences if it’s not responsibly managed by the farm. 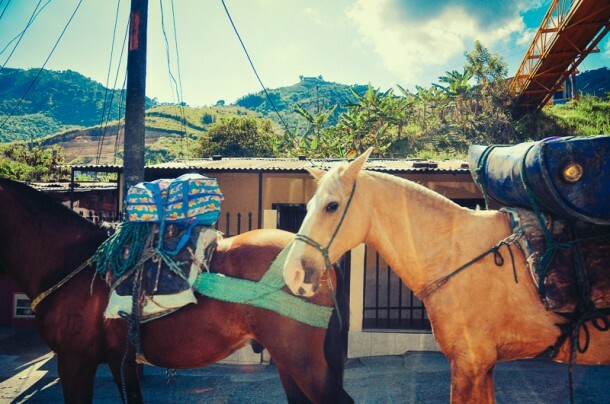 The farm we visited in Colombia uses a more efficient method of wet processing. Rather than slowly fermenting to remove the mucilage in water tanks, Alirio uses a “mechanical demucilager” that removes the pulp and mucilage immediately through friction and only a small amount of water. It’s much faster, produces less waste, and by removing the need to manage fermentation, it can result in greater consistency. It does, however, mean that he doesn’t get the potential benefits of fermentation. 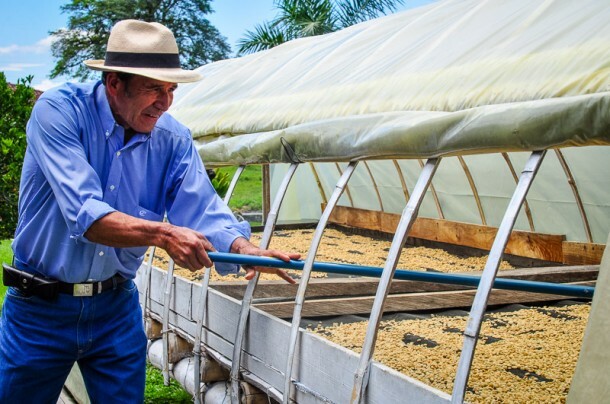 To remedy this, Cenicafe, the Colombian national coffee research center, has been developing new machinery that combines dramatically improved water efficiency with the benefits of controlled fermentation – but that’s a story for another article (stay tuned!). In dry processing the coffee cherries are sorted, laid out to dry for several weeks on a patio or raised drying bed (or mechanical dryers in some cases), and finally milled to extract the seeds. 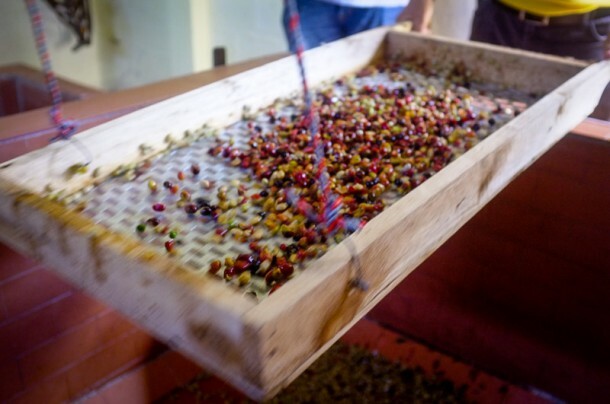 Drying with the fruit still intact around the seed affects the final coffee flavor, often creating intense strawberry or blueberry aromas and a complex, sometimes funky boozy fermented flavor that not everyone appreciates. Some of these flavors are considered desirable and therefore increase the value of the crop. However, it’s a risky method for the farmer as variations in the drying process (e.g., unpredictable or overly humid weather patterns, uneven drying, duration too long or short) can lead to flavor defects or inconsistencies. A variation combining both wet and dry processing is called “honey process” or “pulped natural,” where the first layer (pulp) is removed via wet processing, and the rest is laid out to dry. Waste pulp and mucilage get pushed out the back. Notice how little water is flowing out as waste. Then the parchment coffee is sieved to remove unwanted pulp and other stuff that made it through. The only remaining layer to remove is the tough parchment covering the seeds. 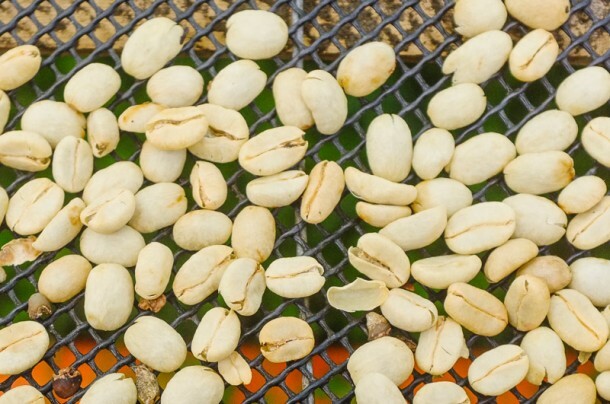 Coffee seeds are hygroscopic, meaning that they readily absorb moisture and aromas – part of the reason why it’s bad for green coffee to sit around in jute bags, or for your roasted coffee to be exposed to air in storage. They’ve just been washed in water, so to reduce the moisture in the beans the next step is to dry the seeds for around a week. Sometimes this happens on patios or with mechanical dryers, but raised beds or solar dryers like what you see below are ideal for even airflow. The speed at which the seeds are dried is important – too hot and fast, or too slow, can impact the cellular structure and also dull the flavor. 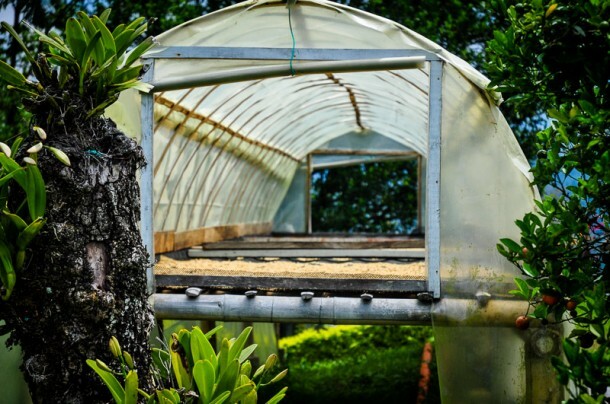 Above, Alirio Rios rakes the coffee in a raised bed parabolic dryer. 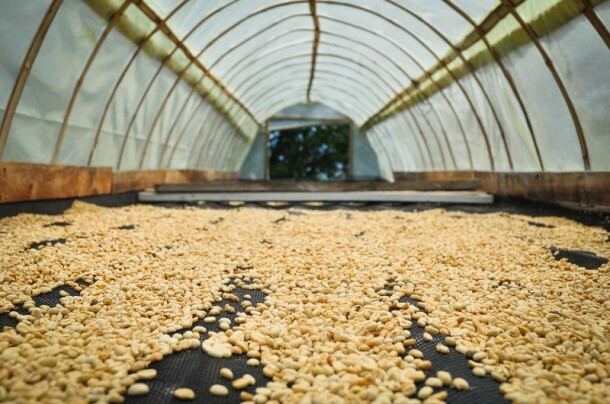 Below, parchment coffee dries on the mesh bed. Finally, we’re ready to take the coffee to be milled and sold. 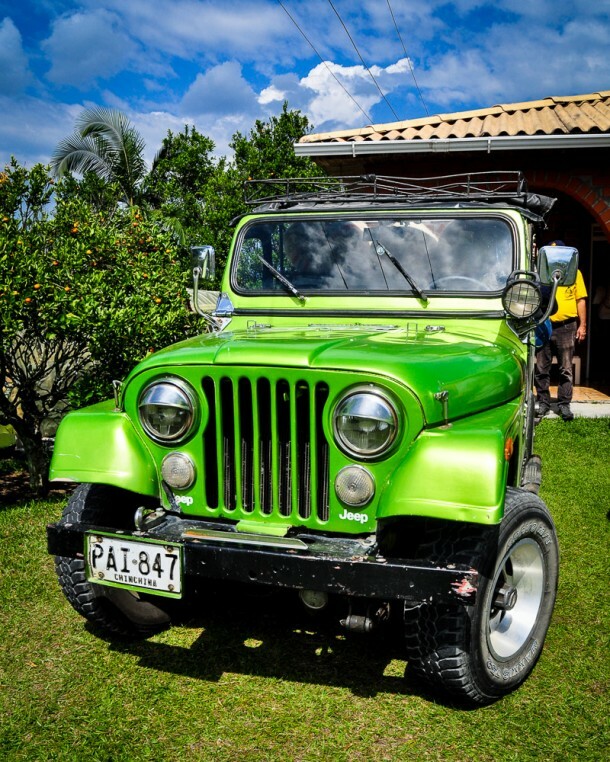 At Finca El Descanso, this means a ride in one of the many awesome vintage jeeps that traverse the rough mountain roads to the regional co-op. Unfortunately we didn’t get to see the entire process at the mill and there’s undoubtedly a lot of complexity at this stage, but essentially what happens is that, in Colombia, the National Federation of Coffee growers (FNC) operates co-ops around the country that farmers can bring their product to for sorting, quality evaluation, and sale. 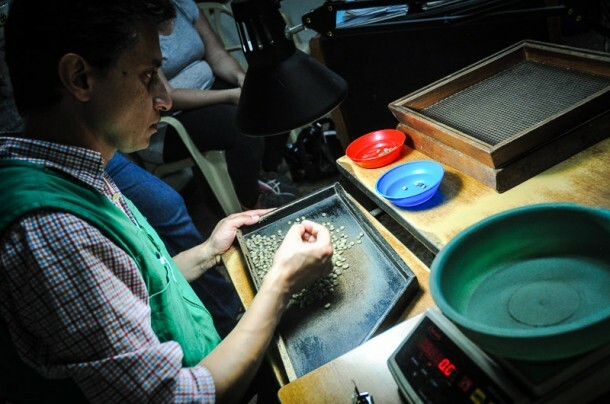 The seeds are randomly sampled, inspected, and an estimated percentage of defects is determined – establishing the price the farmer will be paid by weight. 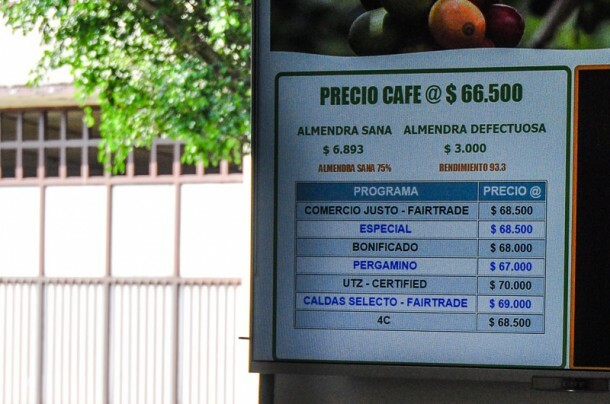 Participation in special programs like Fair Trade or quality-related certifications result in very slightly higher prices. With a sale agreed upon, the parchment coffee is hulled, removing the coffee beans, and then sorted in a variety of ways, cleaned, and bagged. 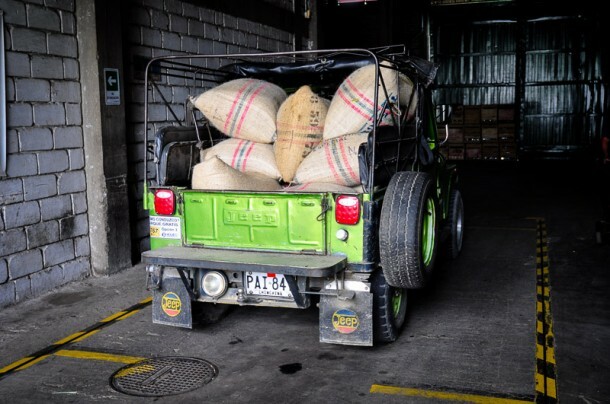 This is just one example of how coffee can go to market – others might include direct trade relationships between a specific roaster and a farmer, or importers that operate their own mills. 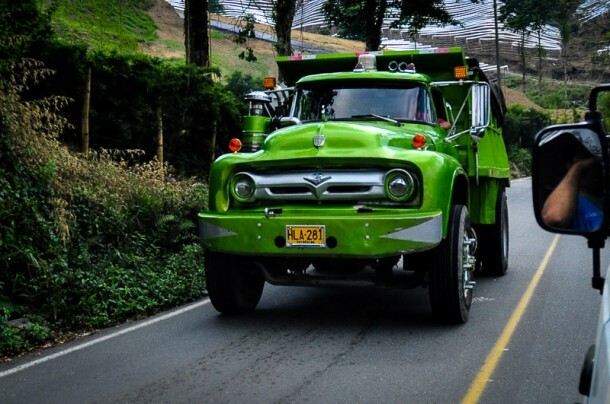 The truck is weighed coming in, and then once it’s empty, to determine the coffee weight. Samples are pulled out of the bags for quality grading. Samples are sorted and calculated to determine the percentage of defects that the lot contains, resulting in a final price. 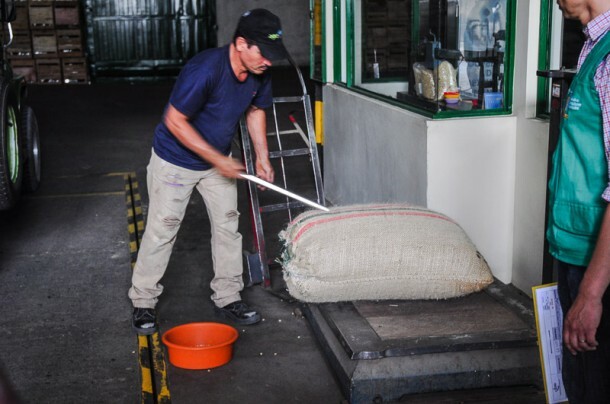 Co-ops use a variety of methods to sort out defects before bagging the final coffee for export. Above, the daily price is displayed live – and available online or via phone – so that farmers can take the trip to the mill when the price is favorable. Programs that provide a higher sale price are listed at the bottom of the screen. 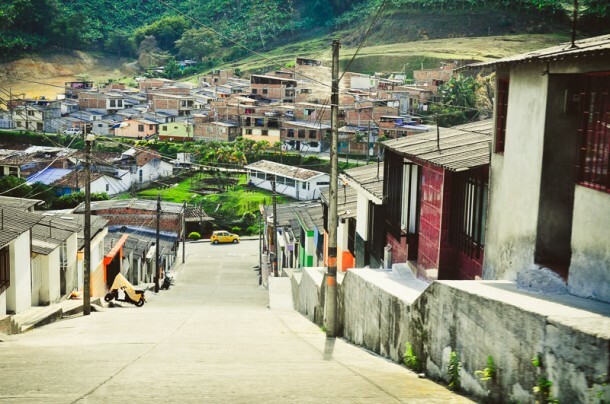 To be sure, there’s great diversity within Colombia and across the coffee producing world as farms vary in size, strategy (specialty vs. volume production), local tradition, climate, and more. While this is just one example, my hope is that it illuminates the relationship between what we drink every morning and the tough choices, artisanship, and raw labor it takes to create it – before it ever touches a roaster or barista’s hands. 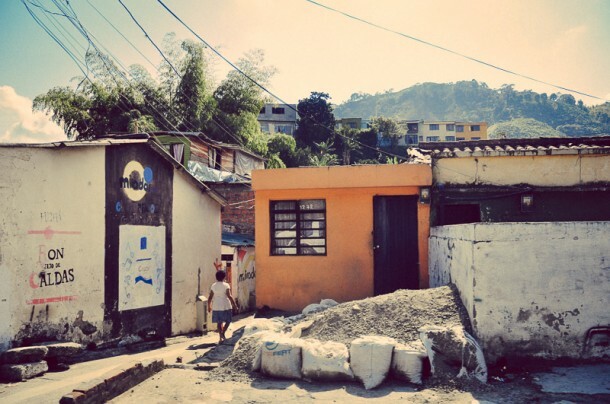 The question of who tells this story of “origin,” and to what ends, weighed on my mind while in Colombia, and in the process of writing about this whole amazing experience. A lot of what gets said about where coffee comes from ranges between cryptic and unhelpful info-dumps, to poetic narratives tinged with a whiff of Orientalism. Part of the answer to that question, and something I was struck by when visiting specialty roasters & cafes in Colombia, is how exciting it is when there’s a full-circle connection from seed (farmer) to cup (barista and consumer). Many possibilities open up when the wide gaps between actors at each step are closed and everyone works together in a virtuous cycle. Some of the better specialty coffee roasters around the world have taken efforts to reduce the distance between the farm and the end product through collaborative projects (e.g., investing in infrastructure, trying to create more space for dialog and shared purpose). 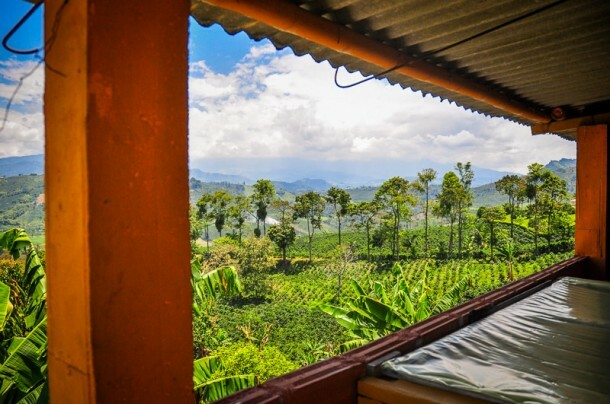 What I saw in Colombia, and what I see happening with people and companies that care, makes me excited for what the future of coffee holds – as well as the global relationships embodied in the cup. If you’ve fallen for finely crafted coffees that express the terroir, coffee variety, and processing methods used by the farmer, then you’ll realize how wildly underpriced most great coffee is – and hopefully come away from articles like this with a deeper appreciation (and willingness to reward with your wallet) both the work and the risks entailed when a farmer (and a roaster, and a cafe) invests in quality. Especially when the majority of coffee farmers face existential threats from pests like the coffee borer beetle, devastating plant fungi like leaf rust, and climate disruption due to global warming. 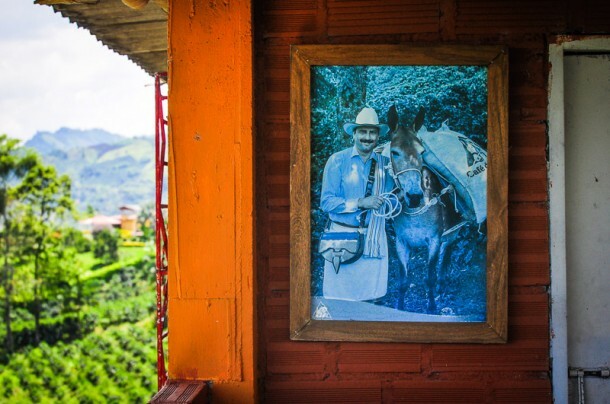 To learn more about how coffee is made, and Colombian coffee in particular, check out the Colombian Coffee Hub which focuses on connecting specialty coffee growers, coffee professionals, and coffee enthusiasts. Also, keep an eye out for future articles here on FRSHGRND about the super interesting work happening at Cenicafe, Colombia’s unique national research center for coffee. More soon! 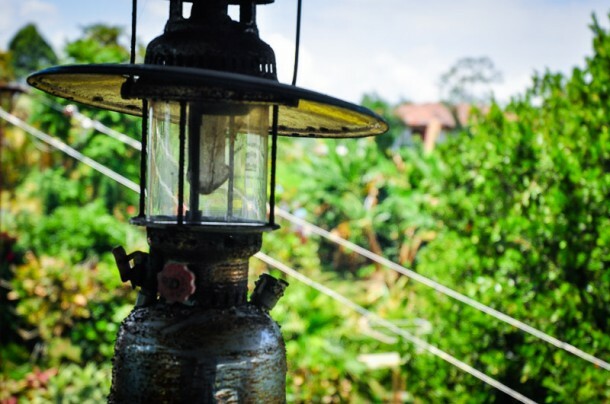 A few more photos below – also check out ArtMundane to see some of the other photos I took! Hi Sanu, what I saw in Colombia is that they were turning the discarded mucilage (pulp) into a kind of molasses and putting it into jars. 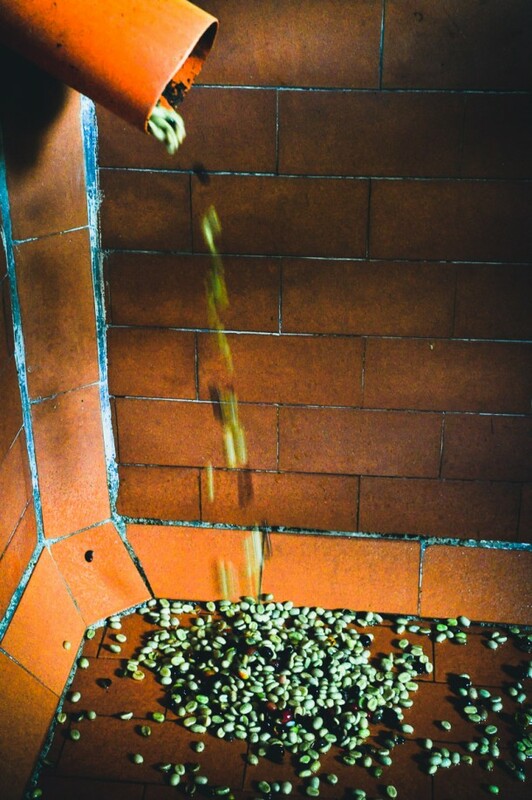 Hey – which finca did you go to to learn about this process? Going in a few weeks and would love to do the same! thank you. Hi! I went with Cafe de Colombia who arranged a press trip. 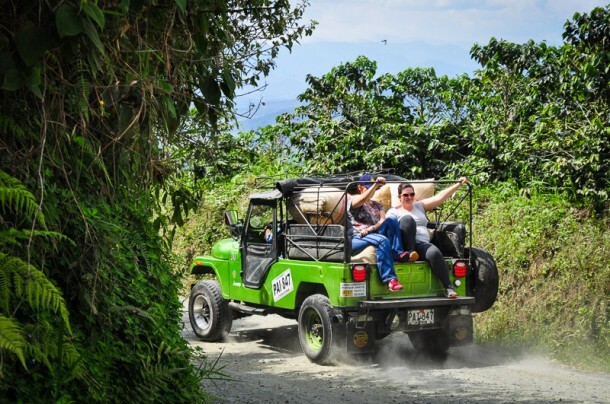 I don’t have a good recommendation for a public coffee farm you can visit, but I’m sure they’re out there. Sorry!